Jack Randolph “Randy” Burchett was born on August 13, 1940 to Jack and Blanche (McClure) Burchett in Claremore, Oklahoma. 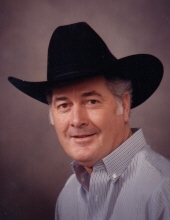 He departed this life on April 11, 2019 at his home in Pryor at the age of 78. Randy grew up and attended school in Pryor, graduating from Pryor High School in 1958. He was a lifetime resident of Mayes County. On April 9, 1988 he married Donna Hall. Randy worked for Williams Pipeline as a pipeline inspector until retirement. He was a charter member of Pryor Elks Lodge and a gold card member of the PRCA. He was also a member of the Cowboy Gatherin’ Church. Randy enjoyed steer roping and team roping. He was also a very talented welder and metal fabricator. He was a friend to everybody and was always there to lend a helping hand. Randy was a great guy and he will be deeply missed by all who loved him. He is survived by his wife, Donna, of the home; one son, Randall Burchett of Tulsa; four grandchildren, Leslie, Corbin, Dalton and Kelsi; four great grandchildren, Noah, Abram, Shaun and Stetson; one sister, Ernestine Booth of Pryor and sister in law, Glenda Burchett of Rome, Georgia. He is preceded in death by his parents, Jack and Blanche Burchett; one son, Shaun; one sister, Pat and one brother, Gary. To send flowers or a remembrance gift to the family of Randy Burchett, please visit our Tribute Store. "Email Address" would like to share the life celebration of Randy Burchett. Click on the "link" to go to share a favorite memory or leave a condolence message for the family.